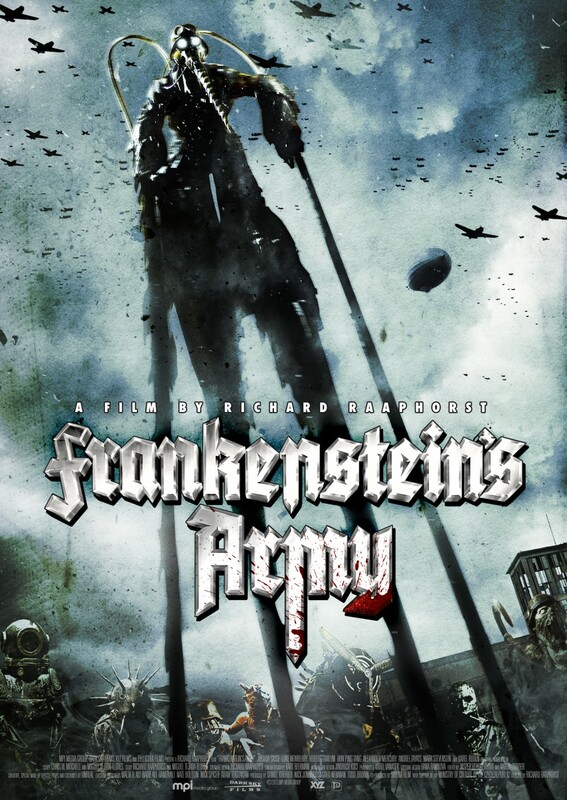 Line from this film: "My father said, men will be more efficient if they have hammers and screwdrivers instead of fingers"
Frankenstein’s Army, a sci-fi / horror film directed by Richard Raaphorst, is a wildly imaginative, blood-spattered monster movie. Set during the final days of World War II, this 2013 found footage shockfest follows a small squad of Russian soldiers, under the command of Sgt. Novikov (Robert Gwilym), as they make their final push into Germany. Tagging along is Dimitri (Alexander Mercury), a filmmaker and loyal Party member who plans to turn the squad’s adventures into a propaganda movie. Soon after crossing into enemy territory, they receive a distress call from another Russian unit that claims to be pinned down by enemy fire. Hoping to offer assistance, Sgt. 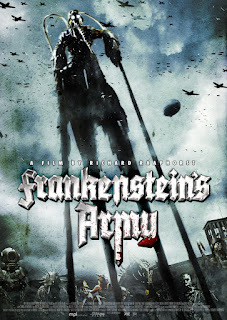 Novikov leads his men to the coordinates specified in the message, but instead of a war zone, they find themselves up against a house of horrors concocted by a German scientist named Frankenstein (Karel Roden), who, as a result of his experiments, has fashioned an army of monsters that obey his every command. Frankenstein’s Army gets off to a strong, if somewhat grisly start; along with its clever opening credits sequence, which is designed to look like a Soviet propaganda flick, there are the gruesome discoveries the squad makes as they close in on their destination (including a mound of dead nuns whose bodies have been partially-burned). As for the film’s cast, it does a fine job (especially Andrei Zayats as the out-of-control Vassilli, a soldier who has no qualms about torturing his prisoners), yet the movie’s real strength lies in its creature designs. After wandering into Frankenstein’s lair (which is hidden in the bowels of a church), the soldiers encounter some of the good doctor’s handiwork: half-man / half-machine abominations equipped with a variety of weapons, all of which have been fused to their bodies. From the names alone, you get a sense of what each one’s specialty is; there’s Propellerhead (Tomas Tomas), Razor Teeth (played by both Martin David and Martin Basta), and my personal favorite, Mosquito Man (Klemens Ratijn), who walks around on stilts and has a large, serrated drill attached to his face. Admittedly, there were times I wished Frankenstein’s Army hadn’t gone the found-footage route; never once did I believe what i was watching had actually happened. Yet even more frustrating than its lack of believability was the movie’s over reliance on the “shaky-cam”, which, along with being done to death, occasionally prevented us from getting a good look at the monsters. These issues aside, Frankenstein’s Army is an inspired Creature Feature with plenty of gore, and I had a great time watching its brutal insanity play out. That sounds like a dynamite concept, full of potential. I hope the found footage technique didn't ruin it. Please filmmakers make a sequel or better yet prequel with no shaky cam, no found footage cliche BS. Pseudo documentary would be fine as long as they don't shake the camera too much but what I really want to see is a classic nazi biomechanical Frankenstein movie!